Could this be the happy ending we've all been waiting for? What's this? A happy end to this twisted tale of love, treachery, betrayal, and tragedy? Could it actually be possible? Liberty and Justice say yes! So, we got an offscreen defeat of M2. I'm imagining some really big showdown between Justice and the younger eagle with Liberty being held hostage in a nasty nest a couple of branches above. There's thunder, there's lightning, an inexplicable tumbleweed flying by -- basically, every dramatic, showdown trope that's ever existed is coming together in the epic standoff. There are some nasty insults and accusations thrown around. M2 says something about how Justice wasn't man enough to take the heat from Aaron Burrd, so he had to stick around to clean up the mess Justice left behind. Justice shouts back about how M2 has nothing on the 15 years he gave Liberty; she never loved him, blah blah blah. M2 goes in for the kill; Justice beats him off. It's looking like M2 has the upper hand (wing? ), but suddenly Liberty breaks free from her nest-jail and overturns the entire nest onto M2's head, knocking him unconscious in mid-air and plunging to his death. Liberty and Justice have been spotted together again in their home nest. Liberty is cautious -- her heart has been broken many times in the past month! Can you blame her? She's learned independence, too. She brings fish back to the nest, but she's not sharing with Justice. It's going to take some time to rebuild that trust and get back to their old way of life. No sign of M2 or of Aaron Burrd (thank goodness! Those fellas were too thirsty! ), so it seems safe to say that Justice and Liberty are back together for good. Or at least until next season when M2's son returns to the nest, claiming that Liberty is his biological mother and Justice is sent into a tailspin of trust issues. But that's another show for another time. 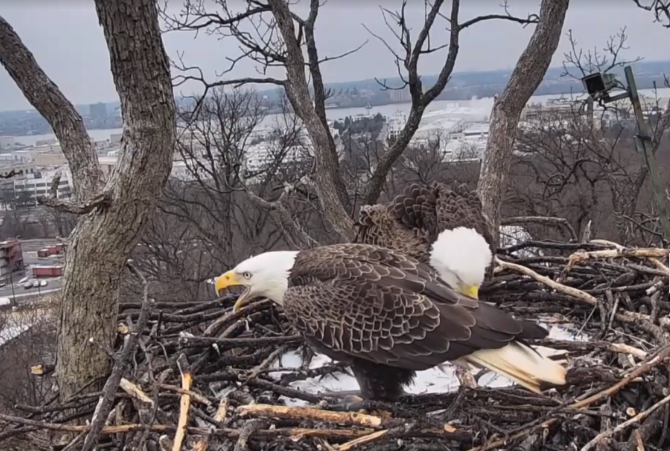 You can keep tabs on the duo by watching their live eagle cam here. Is this happily-ever-after for Liberty and Justice? Let us know in the comments below! 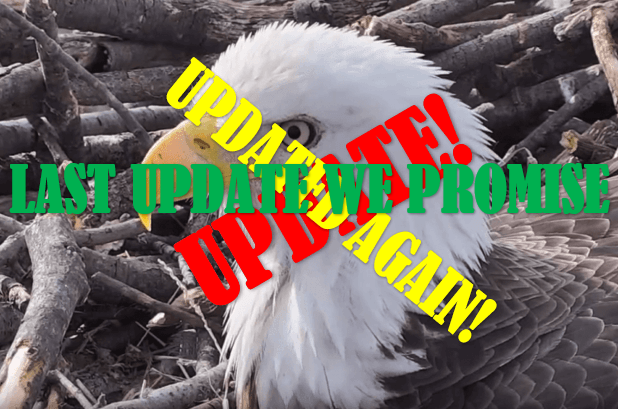 Need to catch up on the eagle drama? Here's EPISODE 1: Justice disappears, leaving Liberty to lean on the shoulders of multiple male suitors whilst tending to Justice's two unborn offspring. Here's EPISODE 2: Liberty realizes that her unborn eaglets have perished, and with Justice still MIA, she chooses a new life with M2. Here's EPISODE 3: Justice returns! But where's Liberty? Is there hope that they can be reunited?